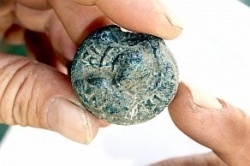 Bulgarian archaeologists have discovered a unique glass medallion with Christ Pantocrator at the excavated fortress of Kastritsi near Varna. The archaeological team is led by Valentin Pletnyov, head of the Varna Regional History Museum. The medallion, which is dated back to the 14th century, the later period of the Second Bulgarian State (1186-1396), is an extremely rare find. It was discovered in the wooden floor of one of the large buildings in the fortress Kastritsi, which is close to the Euxinograd palace on the Black Sea coast. Pletnyov said the medallion was made of copper enamel, i.e. a type of glass produced in Byzantium after the 13th century. The medallion has a diameter of 4 cm, and shows Christ Pantocrator holding the Gospel, and giving a blessing with his other hand. Nothing of this kind has ever been discovered in Bulgaria so far. The archaeologists believe that the medallion was made in the Byzantine Empire, and was then imported to Bulgaria. They also found nearby a medieval scale for coins dated to the second part of the 14th century.